Jenny Lancour | Daily Press Adam McDaniel, a technician with Westwood Multi-Disciplined Surveying & Engineering, conducts environmental tests Wednesday on metal posts that would support panels for a utility-scale solar energy system which Escanaba is considering building on property by the Delta County Airport. ESCANABA — Environmental testing, such as wind and snow loads, was recently completed on a possible site for a solar energy system which Escanaba is considering building on property by the Delta County Airport. Westwood Multi-Disciplined Surveying & Engineering of Eden Prairie, Minn., conducted the studies last week to assess environmental factors such as shade, soil, and water levels, and analyze support posts’ wind load, snow load, and frost heave levels, explained Glendon Brown. Brown is a member of the city’s Electrical Advisory Committee (EAC) and has been spearheading the creation of a city-owned solar generation system in Escanaba to help offset future electric costs by using free power from the sun. During a joint meeting with the EAC on Sept. 21, Escanaba Council approved Westwood conducting studies on the land the city is looking at to build a solar energy system that electric customers could invest in by buying solar panels. Escanaba is considering leasing five to seven acres of land at the county airport to construct a utility-scale solar generation system that would benefit all city electric customers by lowering costs for the city’s entire electrical system. The airport property being considered as a potential site is owned by the county and located west of the airport terminal on the north side of Airport Road. The county allowed the city to conduct testing on Tuesday, Wednesday and Thursday. The solar energy system is still in the assessment stage, said Brown, noting testing was done last week to prepare for the actual project if the system makes economic sense for the city’s electric users, whether they invest in the system or not. The county, which is a city electric customer, has expressed interest in investing in the energy project and would have first right to buy 500 solar panels of the proposed 3,500-panel 1-megawatt project, he added. During council’s regular meeting on Thursday, Electric Superintendent Mike Furmanski presented a brief update on the testing at the site, noting the engineering company conducting the tests loved the flat land being considered for the solar energy system. Analysis was conducted on two different types of posts which are being considered to support the solar panels, said Matt Wessale who answered questions from the Daily Press at the site on Wednesday. Metal posts, including four screwed helical piles and four driven piles, were installed eight feet deep on the site and tests were conducted on each for such factors as wind load, frost load, and snow load, explained Wessale. 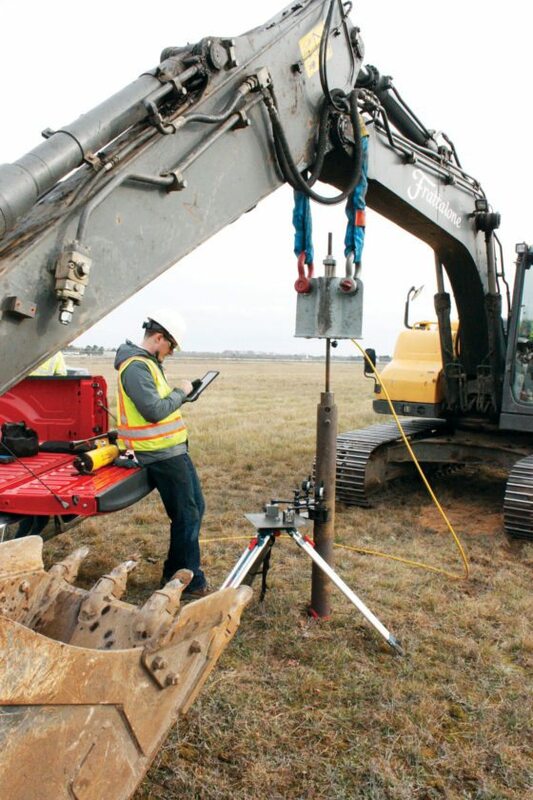 The engineer company also collected additional geotechnical data including groundwater levels. Soil tests were conducted to determine potential soil corrosion on posts and soil makeup such as rocks. At Thursday’s meeting, council unanimously approved hiring Westwood Multi-Disciplined Surveying & Engineering at a cost of $2,750 to conduct a solar glare assessment on the property as required by the Federal Aviation Administration. Data from Westwood’s initial studies will be used later this year to create a proposal to request bids on the construction of the solar project. If the project is feasible and economical, the solar panel system could be constructed next year, said Brown. Depending on the size of the proposed solar energy system, the cost for a 1-megawatt system is currently estimated at just under $2 million. Renewable energy funds collected from electrical customers since 2009 would help pay for the solar generation system with the city recouping some funds by selling panels to those investing in the project. Other funding sources would include energy optimization rebates and federal tax credits for the solar energy system.